Why are households and governments in such vast debt? The answer is that quite simply that wealth has been looted by the corporate sector. They are not returning it in dividends, they are hoarding it. "The nonfinancial firms in the Standard & Poor's 500-stock index have a total of $811 billion in cash and marketable securities on their books, calculates Goldman Sachs. That's just shy of a record high in nominal terms and up $43 billion from the depths of the financial crisis last fall. Squirreling away cash is almost as bad as frittering it away. The returns on idle cash are lousy, and putting cash to productive use is one of management's central obligations to shareholders. Yet with stocks near their lowest valuations in decades, companies are slashing share repurchases; buybacks are running 35% below their levels a year ago. While some outfits like Ford Motor or General Motors would jeopardize their very survival if they didn't cling to every penny, many big companies are being too cautious with their cash by any measure of prudence. 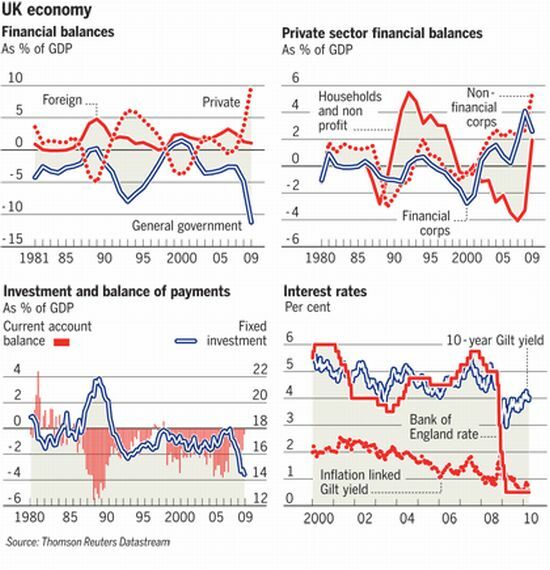 Even as the economy keeps shrinking, their cash balances keep growing. Meanwhile, many shareholders could use some of that cash to make it through the recession themselves. This situation echoes 1932, when the great value investor Benjamin Graham lamented that "the typical stockholder is weighed down by financial problems while his corporation wallows in cash." Corporate bosses, said Graham, "are sleeping soundly these nights, while their stockholders walk the floor in worried desperation." Cash is not trash, of course; the natural urge to set a little money aside for a rainy day feels urgent in a recession. And some companies would take a big tax hit if they brought home the cash earned by overseas operations. But according to Strategas Research Partners, 168 out of the 419 nonfinancial firms in the S&P 500 have at least $1 billion in cash apiece, and 16 have more than $10 billion each. Exxon Mobil has $32 billion in cash, Cisco Systems has $29.5 billion, Apple $25.6 billion and Johnson & Johnson $12.8 billion. Such multibillion-dollar balances are more than a rainy-day fund; they're a 100-year-flood fund." the deficits run by western nations and households has been largely driven IMO, by this hoarding of cash by non financial firms, just when we are all busy bashing the banks. So why are they hoarding cash, Sceppy? good question, why are they doing that when they should be returning dividends to shareholders? answer: they don't care about their shareholders, these corporate entities, like any complex organism, are working to ensure their own survival at the expense of other players, including their erstwhile owners. the primary beneficiaries of this strategy are company management (who seek to perpetuate their position), and the major shareholders who own big blocks of shares but don't require the dividend income to stay afloat. Couldn't the shareholders start getting a bit shirty? The aim is to get as much of that cash paid as director bonuses as possible. If those in charge were carrying out their fiduciary duty, they would be returning as much capital to shareholders as they can. Indeed, there would seem to be some latitude to take these companies to court for failing in their duty. Excess cash is proof positive that they are not acting in the interest of shareholders. Interesting too that Warren Buffett is the main culprit here in acting against the interests of his shareholders. He would argue of course that he is waiting for stocks to drop, hence all the cash, but given that he is expecting low returns from hereon, given the impossibility of growing a company that size quickly, he too would be better off paying a dividend. Cash is an excellent investment during a deflationary period. but the cash hoarding has been going on since the early 1970's. the non financial corporate sector has been running large surpluses since the mid 70s, and even larger ones since 2000.
surplus means that their assets exceed their liabilities by that amount. all other sectors, including financial corps, households and governments have terrible balance sheet positions as a result. People think the banks are the big winners out of all this, but I suggest that actually they are patsies. The winners are visible in the data presented above. Very good question. 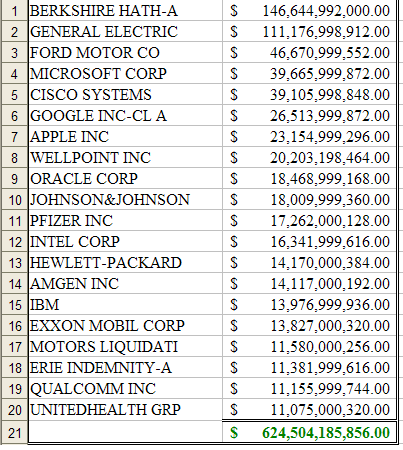 We need to see these corporations balance sheets before jumping to conclusions. Not saying there isn't a point to this just saying that looking at one element does not allow one to form an opinion. Lastly, dividends are not paid out of cash balances they are paid out of reserves. To pay a dividend a company cannot exceed its reserves. The shareholders hold the equity value and trade in and out accordingly. Pay a dividend - lose equity value. How do they gain? Interesting post. Do you have any ideas as to how this cash is held and what affect it is having in various markets Scepticus? e.g 3M T - Bills or longer. I always enjoy reading your posts by the way - quality. Perhaps they expected a crash where they would need cash? It just took 40 years for it to arrive? It's certainly a massive war chest built up. I'd be worried about stuff like this being printed someone might decide to start taxing this cash. Many companies will pay a cash dividend so you don't pay a fee on receiving it, this makes it cheaper than just taking some capital out of your share holdings. Also it's a much fairer way of distributing profits to shareholders than purely betting on share price. If I invest a million pounds in a big corporation and the share price stays the same all year, it's a bad investment if i get no return which is why non-dividend paying shares are a big risk. Only shares I would invest in would be 10% and over high paying dividend shares. 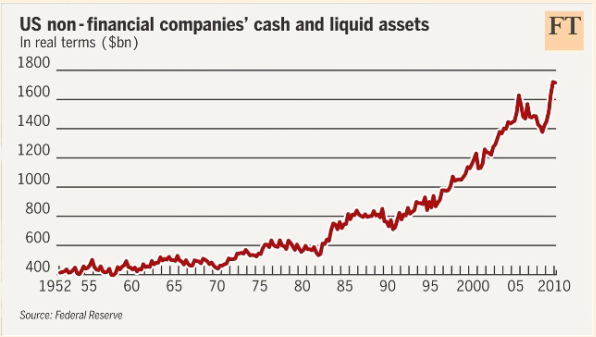 I don't agree with Skepticus opinion that non-financial corporations horde more than financials. Both of them horde a lot, and hide the real figures. I wouldn't believe any figures you see if I were you. what these firms did was build up surpluses in the good years.I only wish our govt had been as sensible. the banks are bashed because their corporate leaders bled the system dry with corrupt lending practices and ****ed off before the SHTF,leaving Joe taxpayer to carry the can. How exactly can everyone build up a cash surplus? Please explain the mechanism with the current monetary system. $811bn is small in comparison to the Federal deficit? what is the federal debt again? some 50% of is held by foreigners so the remainder is presumably held by the US corporate sector (financial and non financial), and by households. However the data very clearly implies that the household holding of treasuries (which has been tiny until very recently) is massively outweighed by their liabilities to banks. On the other side of those bank assets, must be the liabilities owed by the banks to these non financials. secondly,what are marketable securities and what proportion of the total do they constitute? they would be treasuries and ABS. are they marked at par courtesy of some Moody's rating or are they marked to market?it also can't include future pension liabilites that will result from a major dislocation in bond stock markets. treasuries are always marked to market. pension liabilities may have some impact but I don't have data for that. it is not possible for everyone to 'be sensible' as you put it, at the same time. However because these firms are not returning profits as dividends calls into question the notion that profits are returned to workers via dividends. My view is that banks are bust because they are the go between between the patsy/sheep sector (households and government) and the wolf sector (non financial multinationals). Obviously by intermediating this unequal relationship the banks were always going to come out of it badly. prudence dear boy, prudence. prudence can overcome any mathematical certainties or accounting identities. incidentally, the monetary system doesn't really matter. under any conceivable system including pure gold coins the sectoral balances will sum to zero. In the gold coin case if we transport that to todays scenario, the non financial corporate sector (there would be no financial sector in this case) would have a surplus of 100% of the gold coin stock, and everyone else would be short by 100% of the gold coin stock. nope, even liar savings and liar debts sum to zero. it is not possible for all sectors to accumulate net liar savings. Or they don't trust Manhattan/City anymore after their numerous continually exposed scams and "one-way betting" casinos! Which will lead to a stand-off, cutting off trades thru Cities and the final implosion! Where/how are they storing this cash? To save Injin the bother. You go to Bank A and open a savings account. You show them your ten pound note so that they know that you have it. They let you keep it in safe custody and credit your savings account with ten pounds. You then go to Bank B and do the same thing. Rinse and repeat until you have been to every bank. Wait for your statements to come in. Hide the Bank A statement and show Bank A all the other ones. Show them the original tenner too so that they know that you are a trusted and loyal customer who has looked after their tenner. They will then credit your account with all the tenners that you 'deposited' with the other banks. It works. Ask any banker. oh I see, liar savings = borrowing, yes? is all borrowing liar savings?